Corrective inserts: Often pre-manufactured, they are added to the orthotic device to increase patient comfort or range of function. Ergoresearch’s exclusive design is called Webfit®. Unique patented technology supports this design. It allows trigger points to be analyzed and determined by way of artificial intelligence, and the creation of an optimal orthotic design matching the foot’s surfaces according to its pressure points. The assessment is carried out at half-load. 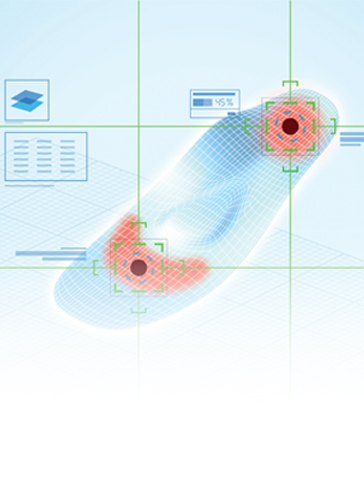 For each of the patient’s feet, a numerical mold is created made of calibrated foam that mildly pressures and slightly deforms the foot’s shape. Because structures splay under an individual’s weight, to properly correct foot position a pressure assessment is absolutely necessary.